Large drop ceiling air vents have a faceplate size of 23.75 x 23.75 inches and are made from an all steel construction. Our commercial vent covers are finished in a bright white enamel that will look great in any office, hotel or restaurant. 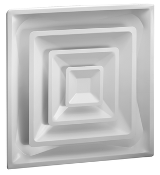 These drop ceiling air vents are meant to be installed right into your ceiling grid, replacing a ceiling square. 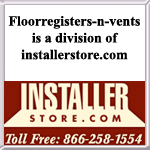 The commercial vent covers do not require any type of installation tools, but are simply dropped into place. The drop ceiling air vents have a duct collar that is 2 inches in height and has a diameter choice of 6 inches, 8 inches, 10 inches, 12 inches or 14 inches. These collars should slip right into the duct work for a sealed fit. The commercial vent covers are sold without the damper, but are compatible with the 3800 butterfly damper found on our website. As a drop ceiling air vent, it has a three coned faceplate which allows for ample air distribution. Also, the commercial vent covers create a 360 degree airflow and have an insulated backing that will help conserve energy. Important: Commercial vent covers are typically in stock but availability is subject to change. If the drop ceiling air vents are not in stock, approximate lead time to ship is 2 to 3 weeks. Order non insulated commercial vent covers from our site along with the butterfly damper to get optimal airflow. These drop ceiling air vents are easy to install and are made with quality and care. Click or call today to order!